As with many of our recent walks, we were lucky with the weather at the end of October for our guided heritage walk looking at some of the disused gritstone quarries on Stanton Moor. Fourteen of us met near Birchover, including one couple whose ancestors quarried at Stanton for at least 200 years. 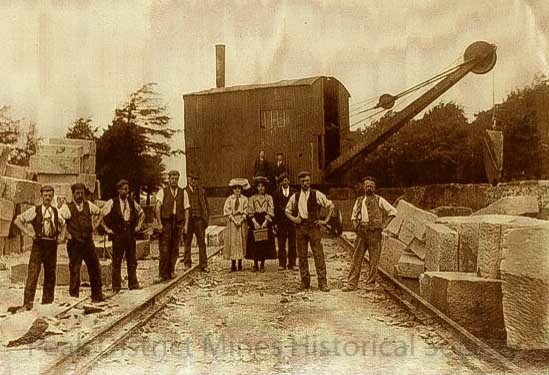 They brought with them the wonderful photograph below of several members of their family with a steam crane at one of the quarries. The group of 15 set off from Castleton to Odin mine sough tail, Trickett Bridge. The stream bed here is stained orange due to iron in the shale the sough runs through. The valley bottom is mostly of shale with the reef limestone rising up to form Treak Cliff and Long Cliff. Sunday 5th November 2017. Meet 9.45am for 10.00am start. Meet in the layby below the mine spoil tip in the Via Gellia on the A5012 (grid ref SK 269566). If the layby is full, further parking is available in the next layby up the Via Gellia (heading west), approx 0.5 mile away. A map showing the layby can be seen here. Sunday October 29th 2017, starting at 10.30am. Leader: Chris James. Contact him at at meets@pdmhs.com or on 01246 208656. Meet in the (free!) public car park at Birchover, just opposite the entrance to Birchover Quarry (OS grid ref. SK242625).